Continuing on south, the road from Fox twists and turns around the sides of the mountains inland from the coast before actually hitting the coast and running along it. All the roads so far on the west coast have been what we remember as good B roads back home. There are loads of rivers and creeks coming down from the mountains and each has been bridged with a single track bridge, so you have to get used to checking the bridge is clear before crossing. As the braided rivers can be very wide, some of these bridges are quite long. 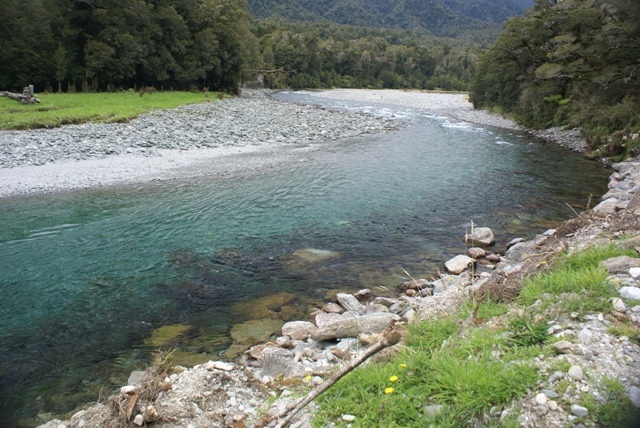 The Haast river which we crossed is a good example. Every river and creek, no matter how small, has a nameplate giving it's name and some of these were quite amusing and they clearly struggled to come up with something in some cases. Haast looked a reasonable size on the map, but actually there's very little there, just a very small village. 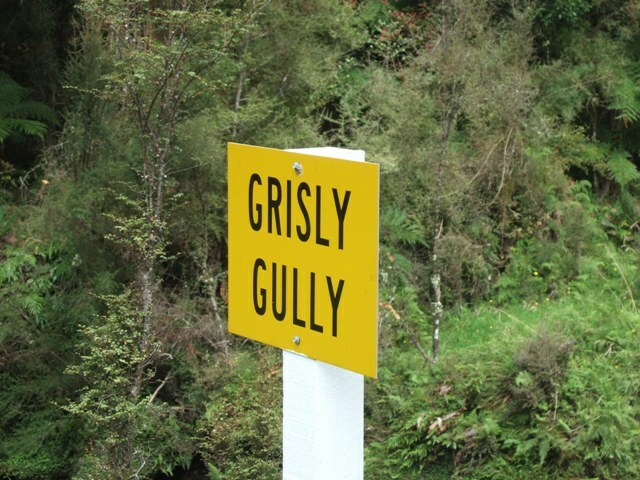 We had booked for 1 night to break the journey to our next stop and had also been told that there was a good drive into remote, pristine rainforest countryside at Jackson Bay, further south and the westernmost village in NZ. So having checked in it was off along the coast to Jackson Bay in the afternoon. Just before arriving we turned off on to the unsealed road we had been told about and drove deep inland on a track through remote forest, rivers and streams. 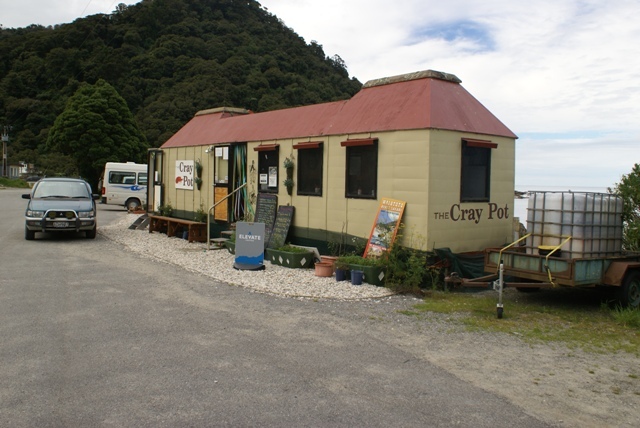 Then it was time to return to Haast, but first to Jackson Bay for the famous fish and chips - the freshest in all NZ according to the locals! It was there, on the beach, that we saw a very rare Fiordland Crested Penguin, sheltering in the undergrowth at the back of the beach. They are seen here, but are so rare and we thought it was the wrong time of year so didn't expect to see them. 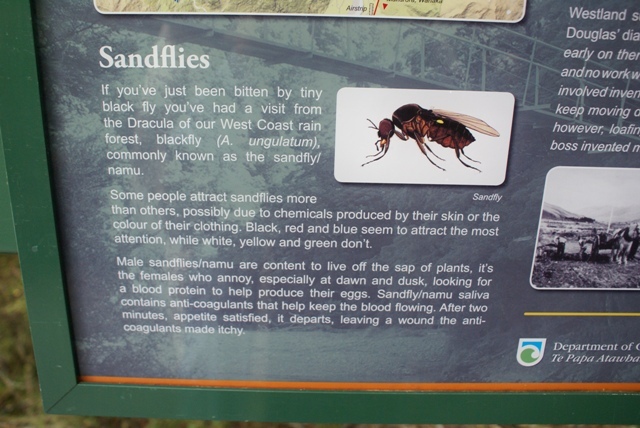 Sand flies are not so rare! The west coast is infamous for them, so come prepared - use repellent or cover up. Covering up is a lot easier than in the tropics as it can be quite chilly in the mountains, even in summer. 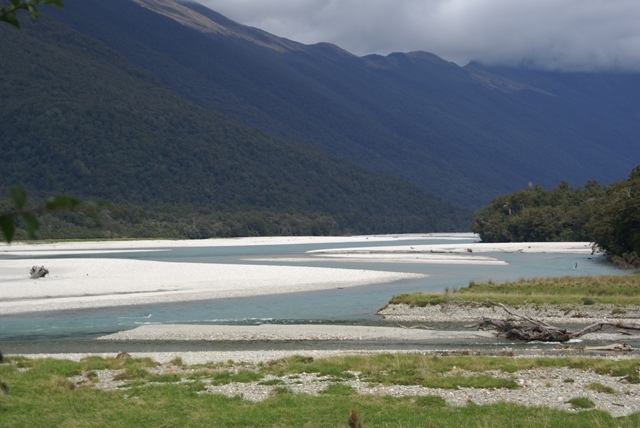 The Haast river winding its way through the mountains. One of the many creeks crossed on the inland track at Jackson Bay. A river on one side of the track and thick, lush pristine temperate rainforest on the other. 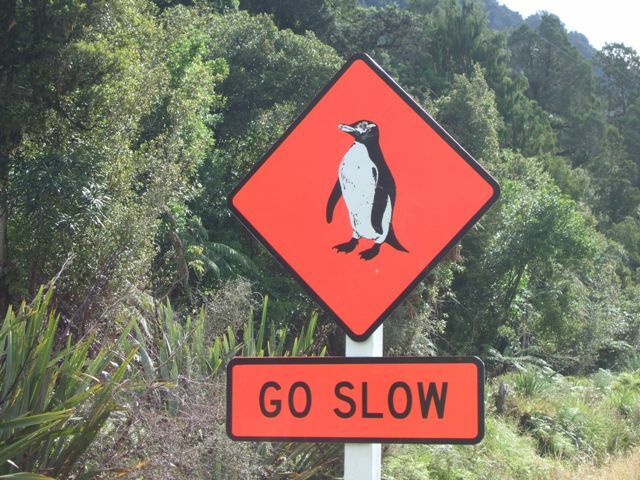 time of year, but having seen one we definitely slowed down and kept our eyes open on the way out! very hungry here! See below.